We believe that one of the first steps to really clear or transform the "mental-spiritual climate" of the planet is through the scientific use of thought. By that, we don't mean self-hypnosis techniques or any artificial behavior-altering methods such as forms of neuro-linguistic programming that is being sold in the media. We are referring to old plain rational thinking! Re-learning our ability to think correctly, orderly, logically and critically. Many people, particularly the mass of humanity, will find this statement odd as it is the general notion that almost all people can think naturally. But from our context, this is both true and false. What we mistake as thinking is actually only our instincts or base human emotions reacting to stimuli using cliches or models or patterns of behavior 'floating around' or those we acquired through conditioning from our environment, without really giving them serious thought!. In eastern philosophies, this type of thinking is referred to as "kama-manas". Formal education was created precisely as an intervention method to make our thinking process rational. That is the correct processing of information and models we gather, examining their relationships and meaning, and contextualizing it to our life. Many philosophers and educators through out the ages, devoted all their lives to discovering and developing rules to correct and logical thinking. Ideally, to be developed together with the thinking faculty, is the conscious widening of the mental horizon through the interface of logic training and the exposure to the macro-perspective of life through the humanities field such as philosophy, history, arts, music, literature, and science. However, we can observe now that is not the case, especially in the mass of humanity and more acutely in what many nations refer to (unfairly) as the "third world". This is evident by how easily public opinion is swayed irrationally by popular emotions through the use of the media. And how we witness the proliferation of cults and extremist belief systems. We no longer know if this is brought about by the degradation of the qualify of human life (under-development) in those areas or this is caused by the failure of the educational system itself, which chose to prioritize information cramming to develop skills to find a job after graduation, over its inherent task to educate, 'humanize', and develop human potential to the fullest. Next step to the ladder after clear thinking using the mind or "manas", is the development of the higher mind or the intuitive mind. This is usually referred to in the educational field as "higher-order thinking" where we begin to think abstractly, solve complex problems, and create solutions and new and original ideas or models. This type of thinking cannot be synthesized by computers into artificial intelligence. Only humans have this ability. We believe this stage can also be developed and facilitated by correct esoteric meditation. 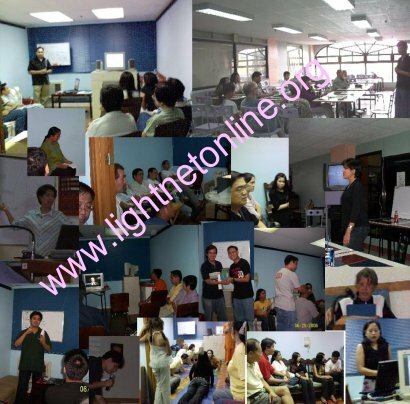 The foregoing principles formed the framework for the development of Light net's educational outreach activities. Photo: The Light Net team at work in its various educational outreach activities @ the Ageless Wisdom Library and other venues. Those designed for the formation of our volunteers wishing to affiliate and serve with us. It is assumed that they have already adequate educational foundation, and thus training is focused on the development of the macro-perspective of esoteric philosophies, essentials of the spiritual life, and higher thinking through meditation. Local community educational projects to help improve the quality of life. Adult informal general education to develop critical thinking skills and values (character ethic) by logic and thinking skills training and by widening their mental perspective of reality through exposure to humanities, history, science, mathematics, arts and literature. In the past, we used to conduct the foregoing training programs and seminar-workshops on a regular basis, either on the Ageless Wisdom Library, on venues provided by host organizations or on appointment, all free of charge. Recently, we temporarily discontinued the seminar-workshops due to change in circumstances and availability of the coordinating and seminar group. The planning sessions are ongoing on how to continue to offer these services in the future. For now, participants and individuals interested in category 1 activities, may want to try online coaching by appointment if you think this alternative will work for you. For groups or organizations who wish to host the seminar-workshops, we may still come to your venues upon invitation, depending on the availability of our seminar team. They will still be offered free of charge due to our commitment to our mission and vision. Just email us and type the seminar or activity name you wish to inquire on in your email subject. Web site and most contents by Light Net, 2014. All rights reserved.